I have been in Renewable since 2005. Now on Geothermal. Yes there is slowdown. But its also in Fossil. Suzlons problem is also tech obsolecence. They still have first gen turbines. 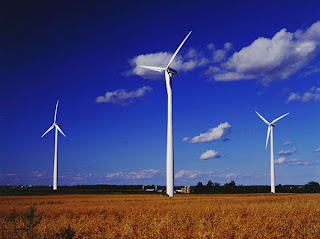 Wind park installations may fall 15 percent in the financial year starting April 2012 from the 2,600 megawatts projected for this year should the benefit be discontinued, said Ashish Sethia, lead analyst with Bloomberg New Energy Finance in New Delhi. The government wants to axe an accounting rule next year that encouraged companies to erect most of India’s 14,157 megawatts in wind projects as a way of cutting taxes rather than generating power. It favors a less-generous subsidy that companies have been slow to adopt. “We could see some disturbance in demand and some filtering out of smaller players,” said Mahesh Makhija, director of renewables at the local unit of CLP Holdings Ltd. (2), Hong Kong’s biggest power supplier and India’s largest developer of wind farms. A 400-megawatt slump in demand could cut investment by 24 billion rupees ($540 million) based on current construction costs. A shakeout may intensify turbine suppliers’ push for new business as wind installations peak in developed markets in the U.S. and Europe. Turbine suppliers in India jumped by a third to 20 last year as the country installed about $3 billion of wind capacity, the most after China and the U.S. While global wind farm installations declined for the first time in almost two decades in 2010, India overshot the government’s target by 18 percent. Anticipating that trend to continue, Siemens AG (SIE) plans its first 500-megawatt wind turbine plant in India by 2013, Gamesa Corporacion Tecnologica SA aims to complete three facilities by 2012 and GE opened a turbine assembly plant in India this year. The alternative subsidy favored by the government “will shift the market focus from investment incentives to production incentive, which is very relevant in the backdrop of energy shortfalls in the country today,” GE said. “This will attract new developers” that will focus on making power more available more efficiently, it said in an e- mailed response to questions. Suzlon Energy Ltd. (SUEL), India’s dominant supplier, said in an e-mail that it welcomed “this shift across investor groups” who are now looking with a long-term view that would mean larger- sized projects, lower transaction costs and more evenly distributed demand throughout the year for the industry. Enercon India Ltd., India’s second-biggest turbine supplier, declined to comment on whether the end of the tax break could impact demand. Suzlon shares fell as much as 4.4 percent, the most in three weeks, and closed down 2.7 percent in Mumbai trading. Suzlon’s stock has dropped 10 percent this year. Suzlon faces increasing competition from new entrants. Its share of new wind installations in India dropped below 50 percent for the first time last year while Spain’s Gamesa topped Vestas Wind Systems A/S to emerge as the nation’s third-biggest wind supplier after just 18 months in the market. The Generation-Based Incentive pays wind farms 500 rupees for every megawatt-hour fed to the grid. Wind developers are pressing to double that to 1,000 rupees and remove an overall cap of 6.2 million rupees per megawatt to make the subsidy as lucrative as accelerated depreciation, said K. Kasthoorirangian, chairman of the Indian Wind Power Association. Hitor Group Inc. is pleased to announce it has executed an agreement with Orient Renewable Energy (Ptv) Ltd. relating to the Hitor technologies including a Manufacturing Plant for the fabrication of construction components and systems for housing and International Housing Development Projects. Hitor will oversee the development, construction, commissioning and operations of a plant for construction components and systems including but not limited to a manufacturing plant for Structural Steel Systems™ or other Hitor technologies. Orient Renewable Energy (Ptv) Ltd. will contribute it's contacts, licenses (as needed), agreements and relational know how and development work to date as well as overall Primary Project Development services in the provision of process development, negotiations with the local Government and approval authorities of and the financing required for the manufacturing plant.